An additional 350 artifacts have been discovered at Osarhat cemetery in Luxor, increasing the number of excavated artifacts at the cemetery to 1,400 so far, said Mostafa Waziry, Director General of Luxor Antiquities and Head of the Egyptian archaeological mission operating atthe site of the newly-discovered Pharaonic cemetery in Luxor. Waziry mentioned in a statement Thursday that the cemetery the resting places of 18th Dynasty nobles, which constituted of an open courtyard leading to a hall and then another long hallway. "After lifting 450 cubic meters of rubble, the entrance to the cemetery appeared and two entrances to two other graves appeared in the courtyard itself," Waziry said. In the hall, a wooden coffin bearing inscriptions was discovered in a very good condition. A nine-meter deep well was discovered with two rooms at the bottom of the well. The eastern room contained ushabti statues and wooden masks. The western room is yet to be examined, Waziry said. 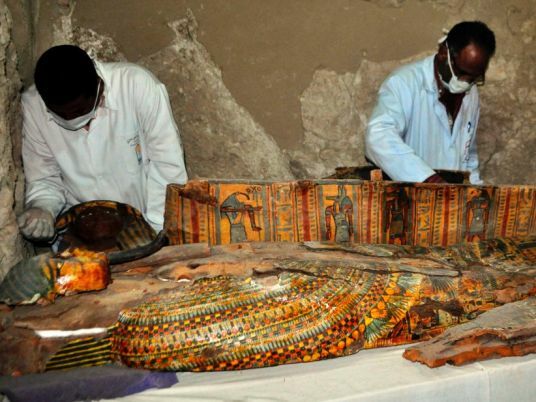 Antiquities Minister Khaled al-Anany announced on Tuesday the discovery of a cemetery in Luxor that contains dozens of coffins, Pharaonic mummies, ushabti statues and masks colored with gold. The cemetery, named "Camp 157", was discovered by an Egyptian archaeological mission on Luxor's west bank and dates back to the 18th Dynasty. It belonged to a city adviser named Osarhat, Waziry said in an earlier statement.